Amazing lamps that will get your inspired to start your own bottle crafts! We’ve been selling our recycled bottle lamp crafts on Etsy for over 2 months now. We’ve compiled a list of our most favorite bottle lamps on the website. This list is based not only on the number of hits each individual bottle lamp receives, but also the number of ‘favorites’ a particular bottle may have within the Etsy community. Scroll down to get inspired to make your own bottle lamp or find the perfect gift idea! Autumn Decor Bottle Lamp or Night Light – This Autumn Leaf inspired bottle lamp is ready for your Fall decorating! 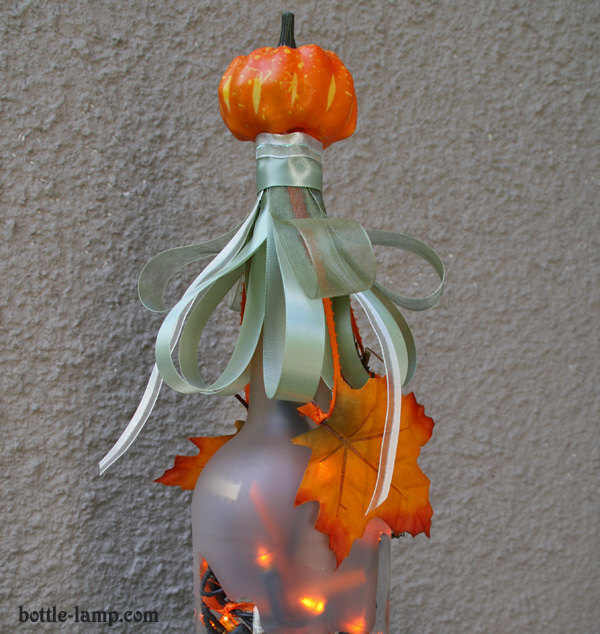 An up cycled one liter glass bottle has been frosted with Autumn Leaf cut outs. Our beautiful Fall themed lighted bottle will be a unique decoration for your kitchen or any other room in your home. Unique Bottle Lamp Makers 46 Night Light – The heavy duty clear colored liquor bottle is filled with a string of white mini lights and amber colored glass marbles. The glass gems give the bottle extra weight to make it a sturdy lamp as well as add the illusions of liquid inside the bottle. Display our Maker’s 46 lamp on a counter, end table, night stand, in your man cave or bar. 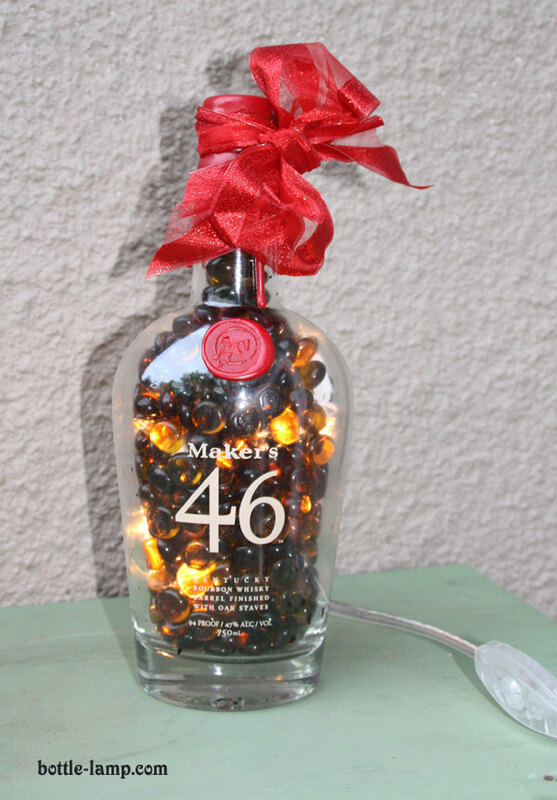 This hand crafted Maker’s 46 lighted bottle also makes a unique gift for any occasion! Ed Hardy Wine Bottle Lamp – Ed Hardy Sangria Wine Bottle Lamp with a fun and colorful label and unique lamp shade. Bursting with the sun drenched flavors of a hot Spanish summer, this lamp is perfect to use as a reading lamp and/or night light. Add a touch of color to your favorite room, place on your counter, end table or night stand. 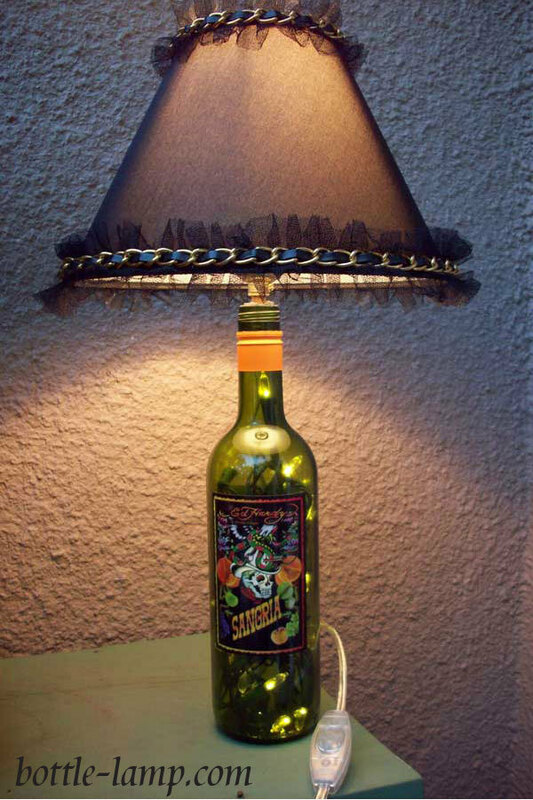 Our hand crafted wine bottle lamp makes a great gift as well! 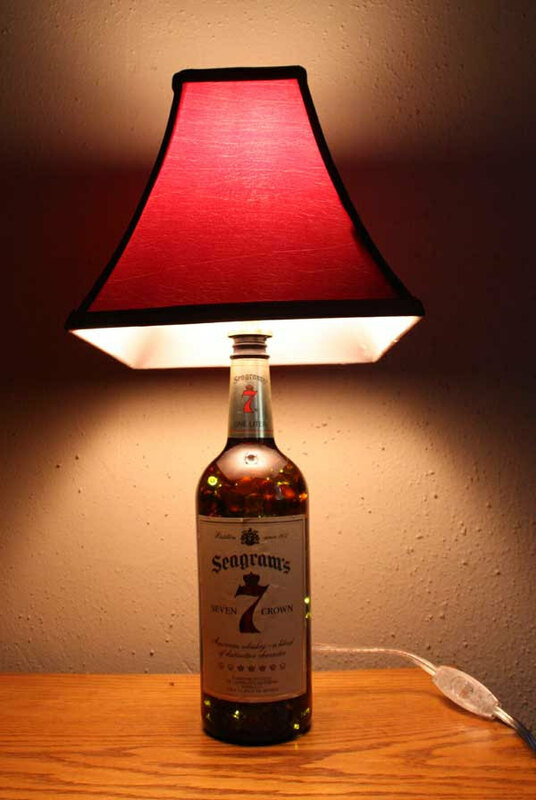 Seagram’s 7 Whiskey Bottle Lamp – The brown colored liquor bottle is filled with cool to the touch LED mini lights and amber colored glass marbles. The glass gems give the bottle extra weight to make it a sturdy lamp as well as add the illusions of liquid inside the bottle. 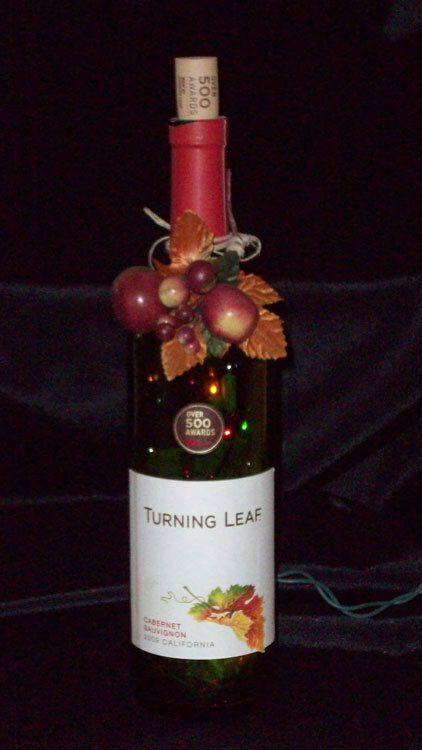 Turning Leaf Lighted Wedding Gift – Use this Turning Leaf 2009 Cabernet Sauvignon wine bottle with lights to add a unique touch to your wine cabinet, your bar or give as a gift to any wine connoisseur. This Bottle Lamp is filled with colored mini lights and adorned around the neck with fall leaves and wine grapes. Remember that you can find the complete collection from Bottle-Lamp.com in our Etsy store! Have we inspired you to make your own unique bottle crafts? Leave us a comment below.